Arya hosts Persian New Year celebration on March 18 and 19. Norooz, or the Persian New Year, is celebrated every year at the spring equinox – March 20. As the first day of spring, Norooz quite fittingly marks the end of winter and the beginning of the growing season. In Iran, Narooz commences two weeks of festivities and holidays. The holiday is centered on a multi-course meal and elaborate decorations prominently featuring the haft-sîn table. Come and celebrate Narooz and experience the unique culture and tradition firsthand. Arya is proud to offer the traditional Narooz feast that will be sure to satiate everyone’s appetite. Farsi – Persian for “Seven Ss,” the Haft Sîn table consists of items all beginning with the letter ‘S’ in the Persian alphabet. These items symbolically correspond to the seven creations and holy immortals protecting them. 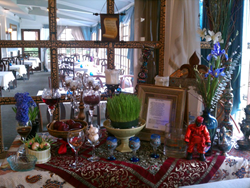 As with tradition, families arrange a Haft Sîn table for not just the spiritual value, but also for visitors to admire their good taste throughout Persian New Year. 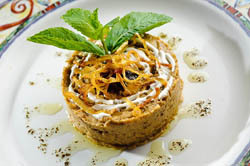 Sabzeh – symbolizing rebirth – wheat, barley or lentil sprouts growing in a dish. Samanu – symbolizing affluence – a sweet pudding made from wheat germ. Senjed – symbolizing love – the dried fruit of the oleaster tree. Sîr – symbolizing medicine – garlic. Sîb – symbolizing sunrise – sumac berries. Serkeh – symbolizing age and patience – vinegar. Sabzi: A colorful plate of imported feta cheese, fresh walnuts, herbs, mint, basil, watercress, tarragon and radish. Borani Bademjoon: A medley of sautéed eggplant, yogurt, onions, garlic, mint and kashk (whey). Salad shirazi: A traditional Persian salad made with Persian cucumbers, fresh tomatoes and onions in a lemon dressing. Ghormeh Sabzi – Sautéed vegetables cooked with dried limes, beef, red kidney beans and special seasonings, served with a side of basmati rice topped with saffron. Gheimeh Bademjoon – Fried eggplant cooked in special tomato sauce, yellow peas and onion sauce, served with beef and a side of basmati rice topped with saffron. Fesenjoon – Walnut pomegranate stew mixed with chicken, served with basmati rice topped with saffron. Baghali Polo with Lamb Shank – Basmati rice mixed with lima beans mixed with dill weed, served with lamb shank. Shish Kebab – Chunks of Filet Mignon USDA choice with bell peppers and onions, served with basmati rice topped with saffron. Chicken Kebab – Boneless chicken kebab served with basmati rice topped with saffron. Koobideh Combination – One skewer of ground beef and chicken served with basmati rice topped with saffron. Sabzi Polo Mahi with kookoo Sabzi – Traditional fish prepared with sazi polo (basmati rice with fresh greens) and kookoo Sabzi. Maklout: Persian saffron and rose water ice cream sandwich with faloodeh. With live Persian music, belly dancing, Arya is sure to make this a Persian New Year to remember. On March 18 and 19, a feast beyond your wildest dreams awaits guests at Arya. With the finest ingredients and centuries of time-tested traditional recipes, this is one meal that deserves to be experienced firsthand. This spring, try something new and celebrate Narooz at Arya’s dinner table. San Jose's Arya Restaurant is a Middle Eastern restaurant that features belly dancing, global cuisine, and delicious and exotic Persian and Italian food. With two locations in Redwood City and Silicon Valley/Cupertino, the restaurant is the result of Chef Mike Hashemi's love for Persian and Italian food, as well as his love for cooking and serving people with the best of both worlds. Arya's San Jose banquet rooms are available for every occasion as well as corporate catering and private dining. Arya is the premier Persian restaurant in Cupertino and Redwood City, California. They are committed to providing each and every guest with superior service and a pleasant dining experience. For more information, visit their website at http://aryarestaurant.com.